I was aked to do a PRE-review of this kit. Modeler/sculptor Jason Napper is attempting to put out a true 1:18 scale Batmobile kit with many features that the best 1:25 scale modelers would envy. Chrome parts, clean lines and high accuracy levels by two of the leading Batmobile modelers have turned out a formidable model. 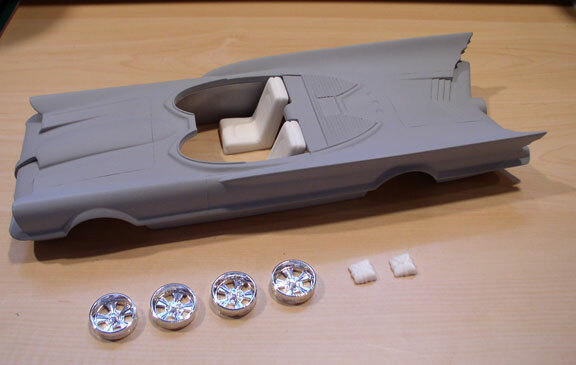 I was sent an early casting of the body, primed grey, a set of seats, 2 parachute packs and 4 chromed wheel hubs. The rest of the kit is due out any moment now and I will update this review when it does. The first thing we should examine is scale. 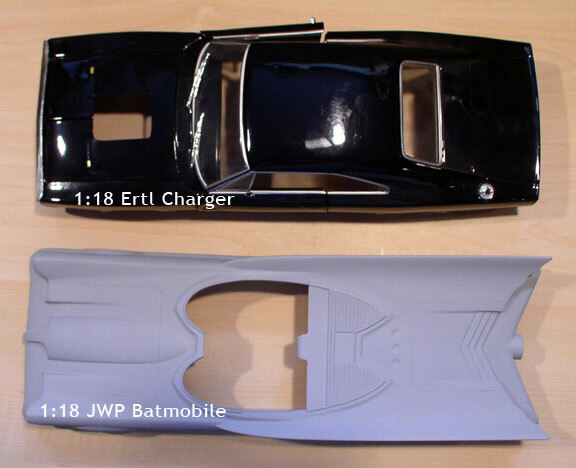 Collectors of the popular 1:18 scale die-cast cars have long wanted a Batmobile to go with their other beauties. The #1 Batmobile was 213.75 inches long. That translates into 11.8″ long for true 1:18 scale. In 2003, Kevin Bessey and Tony Mariano (of T&T models) released a very limited run of a Batmobile kit that many people referred to as 1:18. The model was 13″ long which puts it far over the 1:18 sizing and closer to 1:16.4. A small run of those kits were sold before the makers stopped making them. There is a model on the market now by Gink which, to my eye and from all reports is a version of that same model with a handful of tweaked parts. I have no idea if Gink bought the molds or why this model looks so much like the other. Going on the photos available on the internet – it’s essentially the same 1:16 kit. Seen above is a 1:25 Siderio body, the new JWCM 1:18 body and the Bessey/Mariano 1:16 body for scale comparisons. 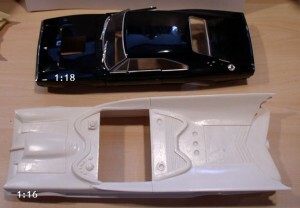 Here is the Bessey/Mariano 1:16 body next to an Ertl 1:18 Dodge Charger. Note the obvious scale discrepancy. There are certainly collectors for the 1:16 scale models. But some people seem to toss the 2 scales around as if they were interchangeable where clearly, they are not. 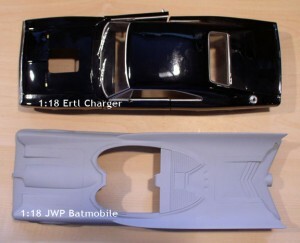 Here is the new JWCM 1:18 body next to the same Ertl Charger. 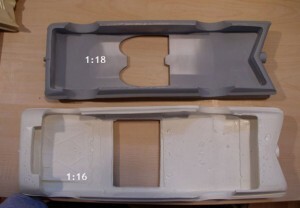 The JWCM model is accurately scaled for 1:18 at 11.87″ Note the clearly similar scaling. Here is the underside of the JWCM 1:18 car compared to the Bessey/Mariano 1:16. Now we will talk about the pattern’s clean lines and molding. One aspect of the new JWCM kit is that it is very thick-walled. I can guess that this was to ensure straight, non-warped castings because they are VERY straight and level. I sat the body on a desk with absolutely no wobble or air gaps. The seats sat inside on the desk and came flush up to the correct spot. Notice also the attention to clean detail on the unseen underside of the model. This is rare and a breath of fresh air. 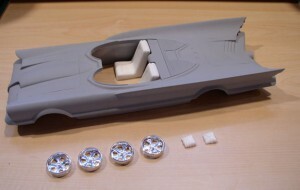 Comparing the model to the older 1:16 car, many details of the JWCM body seem much more accurate to the original car. 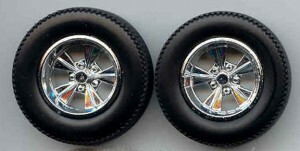 Seen here a comparison of front fender flares. The JWCM is much smoother. It is never a good idea to cast the top dash area as part of the body. It sinks and is hard to keep straight. 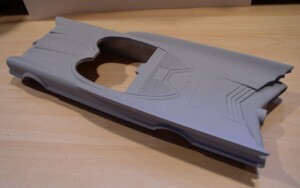 The new JWCM has flawless shaped openings for the canopies and dash parts to fit into. Also notice the lip that follows the contour. This is something that will make canopy placement much more precise and true to the real car. Same thing with the rear lines. 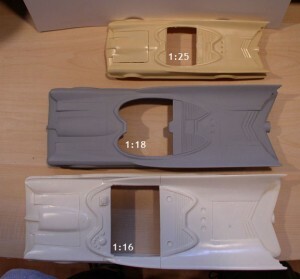 The casting of the 1:16 was pretty rough and the surface was riddled with pour lines, and a mottled texture. The JWCM kit is extremely clean right out of the mold. Plus – compare the preciseness of the rear vent lines. 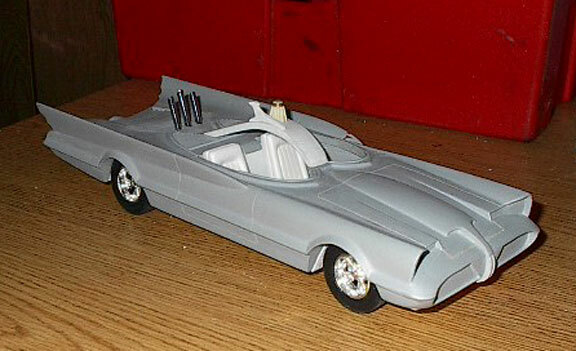 A couple nitpicks: On the body I got – the rear points to the fins were dulled and one was broken. I am fairly sure this was due to it being a Beta model. The scribed lines for the trunk lid seemed a bit rough and crooked. The walls of the car are probably too thick to easily facilitate opening the doors, trunk or hood, and the grilles in front and back are not open as we have come to enjoy from the 1:25 kits that are out there. While many of us can live with non-opening doors etc, most modelers are going to want to open the grille ports up for placement of the PE grilles so that’s a small disappointment. All these problems are easily fixed. Just more Dremel work on an otherwise labor free kit. The plusses so far vastly outweigh the minuses. 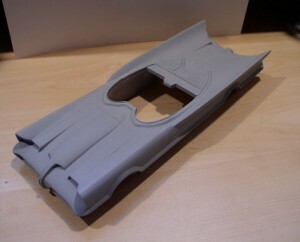 the body-lines are clean, the shape is perfect and the surface is 95% ready to prime and paint as is. It will benefit from a little 400+ sanding after a couple small pits are filled before first paint – but that’s for super sticklers. It COULD be painted as is. The seats look great. Finally we get the full metal bracings! The chutes look fine too. I have a small concern that the wheels are too big diameter-wise. They are chromed fairly accurate Radirs and deep set as they should be – but they do seem a tiny bit big for the car. Remember – the Batmobile had undersized wheels. I’ll hold this final verdict until I see them with their tires and on the car in person. I could easily be wrong. I am unsure what the undercarriage/pan method is going to be. The way the Batmobile sits on it’s wheels can make or break a scale model. In discussing the larger scale models with Andy Garringer, Jim Apitz and others, we have often made the assertion that, based on the amazing levels of detail that have been achieved with the smaller 1:25 scale versions, in this easier-to-work-with larger version – there are no excuses not to get every little thing just as right as you’d like. Better base parts in the kit go a long way to help that and Jason has made a great effort so far. The days where we discarded everything but the base body are over. In addition to Jason’s modeling work, Andy Garringer is designing the Photo Etch detail parts and if history is a lesson – they will be outstanding. Jason is working feverishly to get all the other parts for this kit ready for the rabid market. Updating some older posts. This was one of the first ones transferred over from the original Scooter’s Custom Works website. I left the article up for historical interest. Clearly, it is a sore subject for many. For anyone that ordered one of these and actually received all their parts from the maker (which was rare, we heard) feel free to write me to tell me what you thought of it. I am interested in buying a 1:18 scale Batmobile. However, I don’t know which is the best model to purchase so they can Pimp My Batmobile. Can you help me? What do you recomend? Elite or Super Elite?